Having been hanging round with various writerly types for over 10 years now, I’ve heard my fair share of stories about book covers going wrong, or it taking an absolute age to find a design which both author and publisher are happy with. 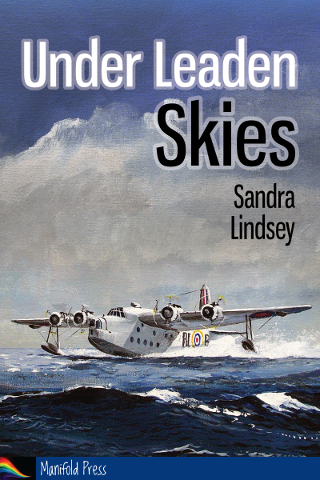 I think it’s fair to say that working with Manifold Press on the cover design for Under Leaden Skies has been completely and utterly opposite from what I had prepared myself to expect! Well. Within 48 hours I had a reply back with a link to a possible *gorgeous* image of a Sunderland flying over the Devon coastline. We went back & to a few times, until the head of the art department stepped in and politely pointed out that all these images were photographs, and the new guidelines are that historical fiction should use painted images. We didn’t bother with a second draft. One comment I’ve heard a few times is that the new style covers really show the mood of a book, as well as being bloody gorgeous!